It is a singular honour and privilege to address this distinguished gathering on the eve of the 45th Anniversary of the Independence of Mauritius. I extend to the Government and the people of Mauritius, warm greetings and good wishes on behalf of the Government and the people of the Republic of India. I would also like to convey my sincere gratitude for the exceptionally warm welcome and hospitality accorded to me and to my delegation today. I thank you for your kind words and agree with your remarks that India and Mauritius share a unique relationship. I am also very happy to see that we stand in a hall named after Swami Vivekananda, whose message of tolerance, compassion and understanding remains universally relevant today. There are few events in a nation's history that compel greater remembrance, tribute, solemnity, introspection and indeed more celebration than the commemoration of its Independence. My thoughts go to the period when India won her freedom in 1947 after a prolonged valiant struggle and courageous sacrifice. Our first Prime Minister Jawaharlal Nehru had gloriously remarked in Parliament "A moment comes, which comes but rarely in history, when we step out from the old to the new, when an age ends, and when the soul of a nation, long suppressed, finds utterance". Mauritius had her own architects of freedom, outstanding men and women; steeled by moral conviction and unfazed by the odds that they were up against. Among them, none stood taller than Sir Seewoosagur Ramgoolam, the Father of the Mauritian nation. Chacha Ramgoolam seized the essence of the struggle of his countrymen and women when he said - and I quote, "The natural evolution of a people cannot be thwarted. That will be accomplished naturally as day follows night". The indelible mark of Chacha Ramgoolam's vision can be seen today in the impressive progress achieved by this country over the last 45 years, most visibly in the crucial areas of education and health which are the cornerstones of a stable and prosperous society. The contribution of visionary Mauritian leaders have transformed this nation's destiny in a relatively short period of time. On a historic occasion as this, it is incumbent upon us to pay tribute to the legacy of those whose sacrifices paved the road to the freedom that is enjoyed here today. Ladies and Gentlemen For India, Mauritius symbolises the very triumph of its own civilisational ethos and character. 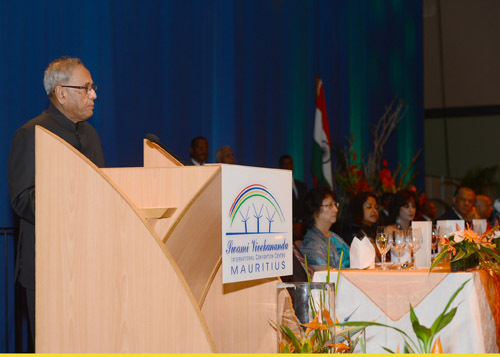 The remarkable socio-economic progress attained by Mauritius exemplifies the victory of the principles that India holds dear to her soul - democracy, rule of law, freedom of expression, tolerance, social harmony and human enterprise. The people of India appreciate the tribute paid by the people of Mauritius to the Father of the Indian Nation, Mahatma Gandhi in selecting March 12 - the day Mahatma Gandhi began his iconic Dandi March - as the Independence Day of Mauritius. Both our peoples are drawn largely from the same historical, cultural and spiritual provenance. Both nations have abiding faith in the ideals of democracy and secularism and both nations intuitively advocate a rule-based architecture of global governance as a bulwark against common challenges such as the threat of terrorism, tackling poverty , human rights abuse, and addressing climate change. It is thus no wonder that the relationship between India and Mauritius has an unwavering vitality. Forged in the resilience of the thousands of brave men and women who were brought here to toil on sugarcane fields, and drawing inspiration from Mahatma Gandhi's epochal and transformative stopover in 1901, our partnership has grown in spirit and substance with each passing year. Regular high-level political interaction has been a hallmark of the Indo-Mauritian bilateral relationship. From the days of Seewoosagur Ramgoolam and Smt. Indira Gandhi, regular bilateral contact at the highest level have nourished and guided this partnership well into the 21st century. Our cooperation encompasses diverse areas of mutual interest including Trade and Investment, Education, ICT, Renewable Energy, Textiles, Science and Technology, Mutual Legal Assistance, Cultural Exchanges, etc. Tomorrow we will discuss how to further enhance this vibrant and mutually beneficial cooperation. Myriad people-to-people contacts are the lifeblood of our friendship. Ladies and Gentlemen, For several millennia, the Indian Ocean has been a key arbiter of the subcontinent's fortunes. You are the proverbial Star and Key of the Indian Ocean. Naturally we have a convergence of interests as the Indian ocean straddles Asia and Africa. Let me assure you that India will remain a steadfast partner of Mauritius. Mr. Prime Minister, we are grateful to Mauritius for standing by us on issues of great importance to India. Mauritius has been steadfast in its support of India's principled, moral and consistent stand on the issue of terrorism. We are grateful for your support for India's rightful claim to Permanent Membership of the United Nations Security Council. Distinguished Ladies and Gentlemen , our bilateral economic and commercial relations have grown in recent years but there still remain areas of untapped potential. India and Mauritius must to explore new avenues and opportunities to enhance and enrich our engagement even further for our mutual benefit. To the communities of Indian origin I extend my felicitations and say to them that India is blessed with a diaspora that mirrors India's own rich diversity. Enriched by diverse linguistic, cultural and religious identities of India you have contributed immensely to the nation-building process of this land, too , making India equally proud of you and your achievements as citizens of this great country . Excellency, I thank you once again for the honour you have accorded me by inviting me to be Chief Guest at your Independence Day celebrations . I speak for all Indians when I say that we cherish our close ties with Mauritius. We see in you a trusted partner in realising our shared vision of stability, peace and prosperity in this region and the world. We look forward to working together with you to achieve the full potential of our partnership. I truly believe that there can be no limit to our success in every sphere. May I request you to join me in raising a toast: - to the health and happiness of Dr. Navinchandra Ramgoolam, Prime Minister of the Republic of Mauritius and Mrs. Ramgoolam; - to the continued success, prosperity and well-being of the Mauritian people; and - to the enduring, successful partnership between India and the friendly Republic of Mauritius.